OK, I'm crying with my first cup of coffee. 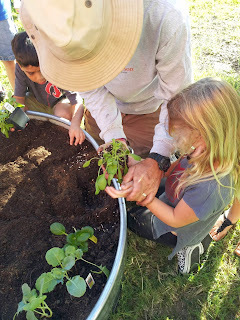 Tears of joy...that I get to have the magic of Dr. Nash in our school garden. Controlling me, who likes to call too many shots was asked how much I know about gardening...well, a lot, enough to know I need a true garden angel to not only help my school garden grow, but to instill the love of gardening, creating beauty, growing food, working together, creating community...well, I can't do that without an angel like Dr. Nash. How lucky are my students and their families, how lucky am I to get this organicgreenlovedoctor in my life?! Now, how to stay back and not direct. Dr., it is OK to tell me to tend to the mud pie bakery and let you work your magic. The kids already know that they need to have a magic quarter in their packet if they want to help...wow...thanks!